Windows operating system provides different ways to manage remote systems. Telnet, RDP, VNC are some of them. But these options are generally bound to a graphical user interface. If we prefer command line interface there is an alternative named Psexec. Psexec is actually a toolset consisting of following tools. PsSuspend used to suspend and resume processes on the remote Windows system. Most of the these tools are provided in 32 and 64 bit architecture. The binaries can be used accordingly. As writing this post latest version of PsTools was 2.45 . 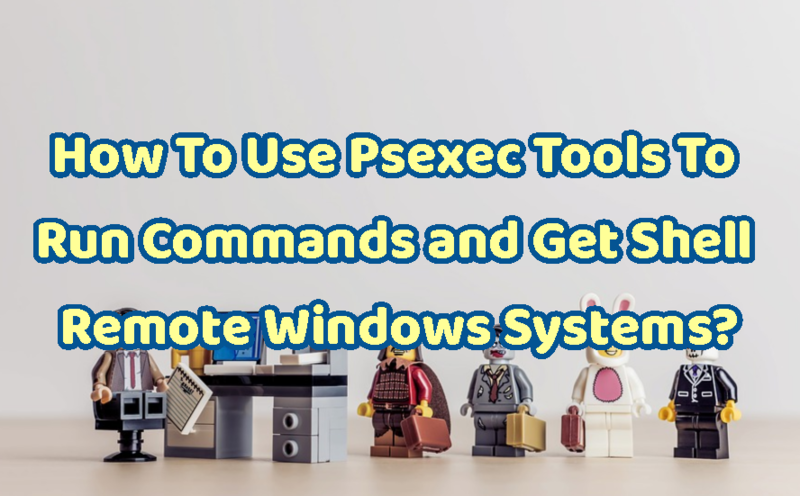 Most basic usage of the Psexec command is just running simply command on the remote system. In order to run command on the remote system we should provide user name and password with the command to be run on remote system. The syntax of the Ps exec is like below. 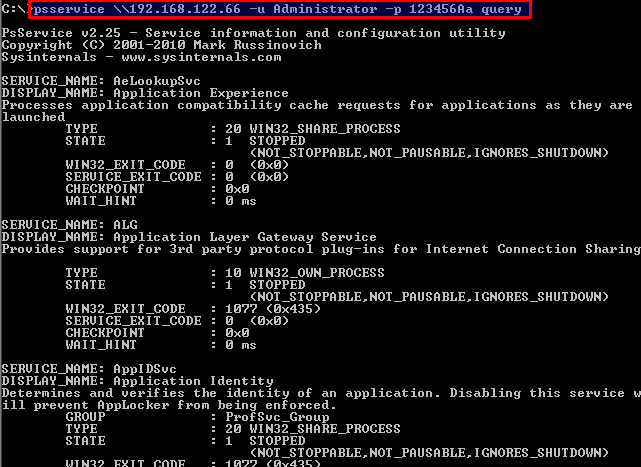 In this example we will run ipconfig command on the remote system where its IP address is 192.168.122.66 . The username is Administrator and password is 123456Ww . As we can see the command is executed in the remote system without any problem. After running command on the remote system the command output will be printed into the current standard output which is our current shell. This output can be redirected into a file with > . If we have a lot of remote systems to run command this option will be very useful. LEARN MORE How To Download, Install and Use Python Idle Editor? In this example the ipconfig command output is saved into file named 192.168.122.66_ipcopnfig . In previous example we have provided the user password. The only option is not the clear text user password. We can also provide the hash value of the user token. Following example we provide the hash of the user token. Running commands on the remote system is very useful feature but there is another useful feature which will easy system administrators and pentesters jobs. Psexec can be used to copy command from local system to the remote system. We will use -c option in order to copy operation. Once the commands finished the remote instance will be deleted. In this example we will copy the cmd.exe . After copy operation is finished cmd.exe will be started on the remote system. As we can see we get a cmd shell on the remote system. While running commands on the remote system the privileges and process owner will be the provided user. If we need to change the remote commands owner user to the System user we will provide -s option. Windows operating systems provides GUI by default. Psexec can be used to open GUI application on the remote system in the specified user console. User console simply means user desktop. In this application we will start notepad.exe on the remote system. The remote system Administrator user can interact with this notepad. We will get our local shell after the remote user closes the notepad. After close the exit code will be printed to the psexec console. Upto now we have run commands remotely. After the execution of the command finished the remote system connection is closed. This is like sessioned connection. Psexec provides remote shell or command line. Psexec connects remote and give us a MS-DOS shell. In order to get a remote shell we will provide cmd.exe command in the remote system. Up to now generally we provided commands to run remote systems. As a system administrator daily operations do not change frequently. Psexec toolkit provides some simple commands to run directly without adding command as parameter. We will look these tools below. PsFile command can be used to to list or close opened files. The syntax is very similar to the PSexec command. In this example we will list files located at C:\Users\ on the remote system. SID is used to identify Windows users in a more detailed fashion. We can list provided users SID with PsGetSid command like below. 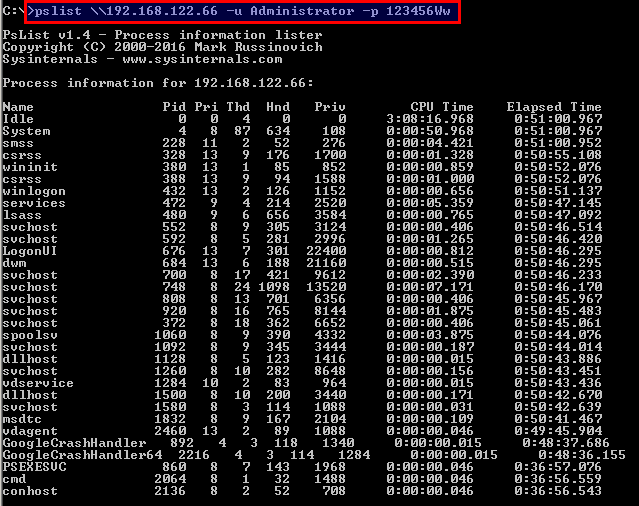 PsInfo is a tool used to get remote system information like Uptime, Version, Windows variant etc. Processes running on the remote system can be easily listed with PsList command. The output will provide following information about remote system processes. Elapsed Time is time from start of the process. Processes running on the remote system can be easily killed with the PsKill command. In order to kill process we should provide the process id or process name as argument. We will kill remote process with process id 2064 . Remote system logs can be dumped into local system easily with PsLogList command. If we use this command without any extra parameter it will dump all event logs from remote system which will fill out command line. So for the example we will limit for last 5 minutes event logs with -m option. Remote system users passwords can be changed easily with PSPasswd command. In this example we will change user Administrator password to the 123456Aa . Another useful tool is PsPing which will create ICMP packets to ping . This command will run local system. PsService command is used to list, start, stop services on the remote system. We can list remote service with query option. Remote service can be started with start option. In this example we will start the service named ALG service. After service started the information about the service is printed. We will stop the ALG service in the following example. Remote system can be shut down with PSShutdown command like below. How To Navigate, List Files and Directories In Windows Command Line With Dir? Great article. Thank you for doing this. How do you get the Hash of the password? There are different ways but most used way is using mimikatz especially in penetration tests.